National Poetry Day is next week! 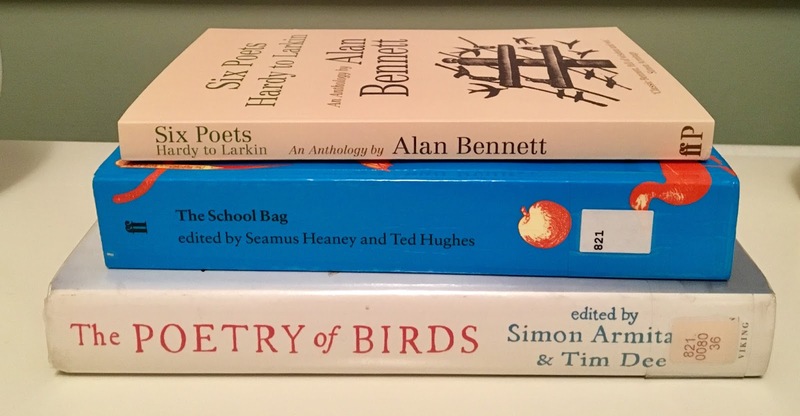 Next Thursday – October 6th – is National Poetry day in the UK and the theme is Messages. Because I like joining in with celebrations related to words, I’m setting up a queue on my tumblr to post a different poem every hour between 12am and midnight of National Poetry day (so that’s 12 poems in all) and they will be links from my twitter and facebook. Some of them will be tied to the Messages theme, some will simply be favourites of mine that I want to share. The three poetry books I’m currently reading, all from my local library! The UK Poetry Society (@poetrysociety) is hosting a lot of different projects and events, and all the information about what they’re doing can be found here – http://poetrysociety.org.uk/projects/national-poetry-day/– and the twitter hashtag for all Poetry Day chat and event sharing is #NationalPoetryDay. I hope lots of you will also join in and share the poems that you love and that have shaped your lives. And now, because I can’t talk about poetry without actually including a poem, this is one I loved as a child and was reminded about just last week, when it appeared in the latest book I received from @PrudenceCrow in my monthly vintage book subscription box. I haven’t had a look to see if there is a tune that goes with this, or was written for it. If you know of one, please let me know!